There will be no formal online classroom this term. 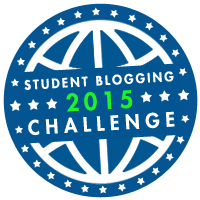 Instead you will be taking part in the Student Blogging Challenge. You can find this by clicking on the badge on the sidebar or on your own blog if you have added the badge and linked it. Week 1 is about avatars and your online personality compared to your real life personality. Complete either of these activities then leave a comment on the blogging challenge website under the week 1 post. Make sure you mention which activity you did and if you enjoyed it. How is your online persona and real life persona the same or different? Open a new post on your blog. On the challenge blog, click on the page above the header labelled October 2015 students. Find 4 blogs of students your age or with your interests. Leave a comment on one post or the About Me page on each of those 4 blogs – before submitting the comment, copy it and paste it into your new post on your blog. Make sure you include the URL of your blog in the comment so they can then visit your posts to leave comments for you. Once you have submitted the comment, click the URL of the blog and copy that also into your post. Once I have published your post, go to the challenge blog and leave a comment on the week 2 post mentioning what you did and include the URL of your post. Week 3 is about using images. From this week on you have free choice of which activity to do. If you choose to do a lot of commenting on other student blogs, then you need to write a post similar to the week 2 post. There are also special event posts – the first one is about #RaiseYourVoice – you can do these as well if you want. Remember each week to moderate any comments that might have appeared on your posts. You don’t have to approve it, if it doesn’t make sense or isn’t a quality comment. Reply to the comment on your blog if the person asks a question. If they leave their blog URL in the comment, go visit them and see if you can leave a comment on their blog. If you look on the Work Completed in the header of this blog, you will see which work needs to be completed by the end of term. I will be publishing your work on a Friday evening so you will be able to leave a comment on the student blogging challenge website after that time – remember to include the link to the post I will have published. If you have any problems throughout the rest of term, try to work it out between yourselves, or ask Mrs Brooks or email me like Zach did the other day. I will try to have my email open Friday afternoons so I can answer you quickly.